Amazon Price: $29.95 $19.70 You save: $10.25 (34%). (as of February 24, 2019 8:57 am - Details). Product prices and availability are accurate as of the date/time indicated and are subject to change. Any price and availability information displayed on the Amazon site at the time of purchase will apply to the purchase of this product. 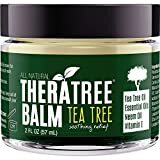 Oleavine TheraTree Therapeutic Tea Tree Oil Balm is infused with botanicals rich in skin nourishing and moisturizing Omegas 3, 6, 7 & 9, Aloe Vera & Natural Vitamin E, along with a blend of broad-spectrum essential oils that have been used for centuries as natural care for skin discomfort. Our non-greasy formula leaves your skin feeling silky smooth and nourished. – Helps Create a Skin Protecting Occlusive Barrier that helps Repel Moisture that Fungus and Bacteria need to Survive and Spread. Helps defend against common causes of skin irritation if you frequent the gym, yoga studio, martial or mixed martial arts studio, public showers or swimming pools. – Works amazing in combination with Oleavine TheraTree Soap, Tea Tree Foot & Body Exfoliating Scrub or Foot Soak as part of our 3-Part Foot & Body Care System for particularly stubborn issues. – Aromatherapy Grade Essential Oils including Organic Wild Crafted Australian Tea Tree Oil, Eucalyptus Blue Mallee and Thymol to help defend against common causes of skin discomfort and irritation. – Fast Absorbing Nourishing Botanicals including Aloe Vera, Neem Oil, Jojoba, Sea Buckthorn Oil & Non-GMO Natural Vitamin E moisturizes and helps soften calluses, dry, cracked, itchy, and irritated skin.